Enjoy cross-country skiing holidays in the Italian Dolomites. Customizable itineraries, expert guides, unique local knowledge, and hand-picked accommodation. Book Today! A cross-country skiing vacation offers one of the most peaceful ways to experience the Dolomite landscape. 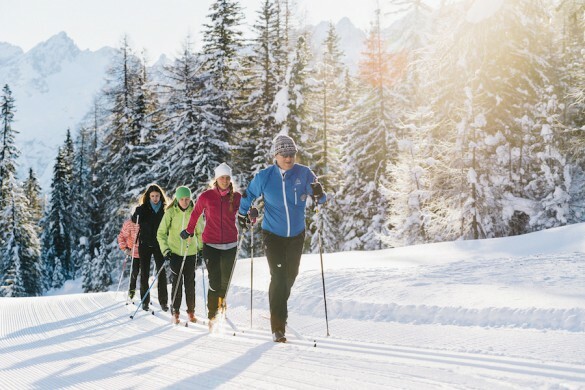 Gliding across perfectly groomed trails, feeling your heartbeat rise as you stride or skate through a winter wonderland, pausing to take in the magnificence of the surrounding peaks… cross-country skiing holidays are an incredible winter respite from reality! While the Dolomite Mountains may be best known for downhill skiing, this area is also a mecca for cross-country, home to both world champions and championship events. The Dolomites 231 tracks comprise over 1,280 kilometers (795 miles) of trails, groomed for both classic (stride) and skate (freestyle) skiing. You can choose to do laps within the resorts, or ski from point to point, resort center to resort center, along an interconnected web of trails. And whether you prefer a relaxing day touring the flats, or to test your limits on FIS-certified competition tracks, you will definitely find the right trails to meet your needs here, all the while accompanied by the picturesque backdrop of the Dolomites. Please contact us for more information on booking your cross-country skiing holiday in the Dolomites. Cross-country ski beneath the towering walls of the Dolomites, gliding over perfectly groomed tracks, taking in the breathtaking beauty of the South Tyrol. Whether you stride or skate, you’ll feel the championship history of the region beneath your feet as you explore the DolomitiNordicski!